Recently, a friend asked me if I saw Dannon’s new yogurt – Two Good Greek Low-Fat Yogurt – that only has two grams of total sugar. I thought to myself, how is it possible to only have 2gm of sugar since yogurt has naturally occurring sugars from milk? Curious for some answers, I did some research. I discovered that Dannon developed a patent-pending, slow-straining process that removes most of the sugar from milk that’s used to make yogurt, resulting in less sugar. 1) Dannon adds active cultures to the milk, which breaks down the remaining sugar even more. 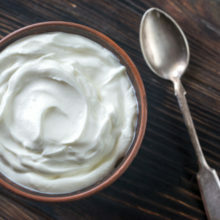 2) Next, Dannon takes the milk and culture combo and strains it slower than typical Greek yogurts, removing most of the sugar and re-concentrating the protein. 3) Lastly, they add a touch of stevia to the yogurt. This new line of yogurt comes in a variety of flavors including blueberry, strawberry, vanilla, peach and mixed berry. With no added sugars and 12gm of protein, this yogurt is a great choice after surgery so give it a try! Let us know what you think in the comments below.